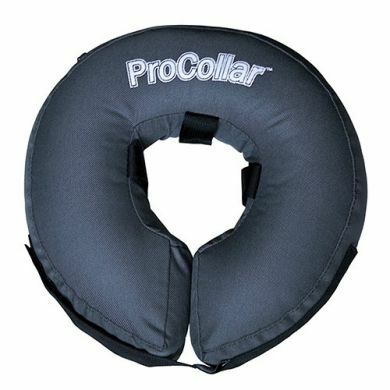 The ProCollar is a comfortable inflatable e-collar. Your poor mate bumps into everything and can't reach his food and drink. It's pretty miserable, especially when the reason your dog is wearing one is because he's already in recovery from some sort of other injury. Talk about compounding the stress! To top it off he has to go around looking like an inverted lampshade. Humiliating at best. There is a better way to keep stitches safe! The ProCollar can protect your dog's injuries without restricting your his vision or preventing him from reaching his bowl. 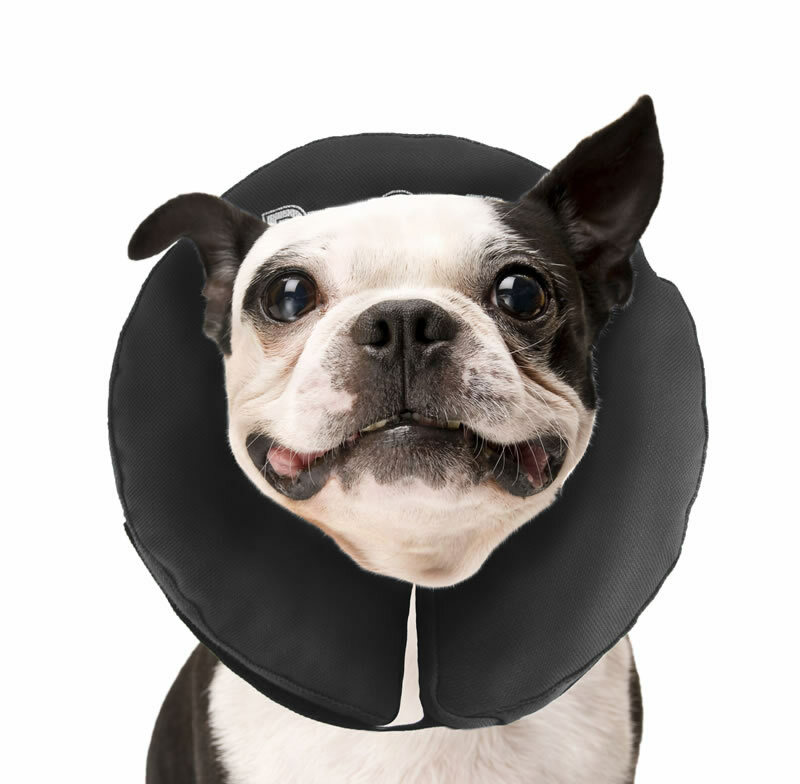 It's inflated and soft so it is like a neck pillow when your dog rests his head against it. The ProCollar has an inflatable inner bladder made of a plastic vinyl that is inflated through a two-way air valve much like a beach ball. Once inflated, the size and thickness of the ProCollar function as a soft deterrent. The inner bladder is protected by a pliable plastic outer jacket lined with a durable canvas material to resist bites and scratches. The ProCollar is held in place by inserting the pet's everyday collar through the the ProCollar's three inner rings. The velcro strap should be placed at the back of the neck and then adjusted for a perfect fit. 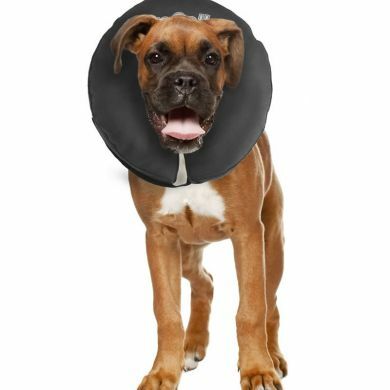 While wearing the ProCollar, dogs are able to eat, sleep and play at ease while staying protected. To prevent another animal from biting the patient's collar, simply rub with bitter apple or ammonia. The ProCollar is machine washable or can be washed with anti-bacterial soap and laid flat to dry. 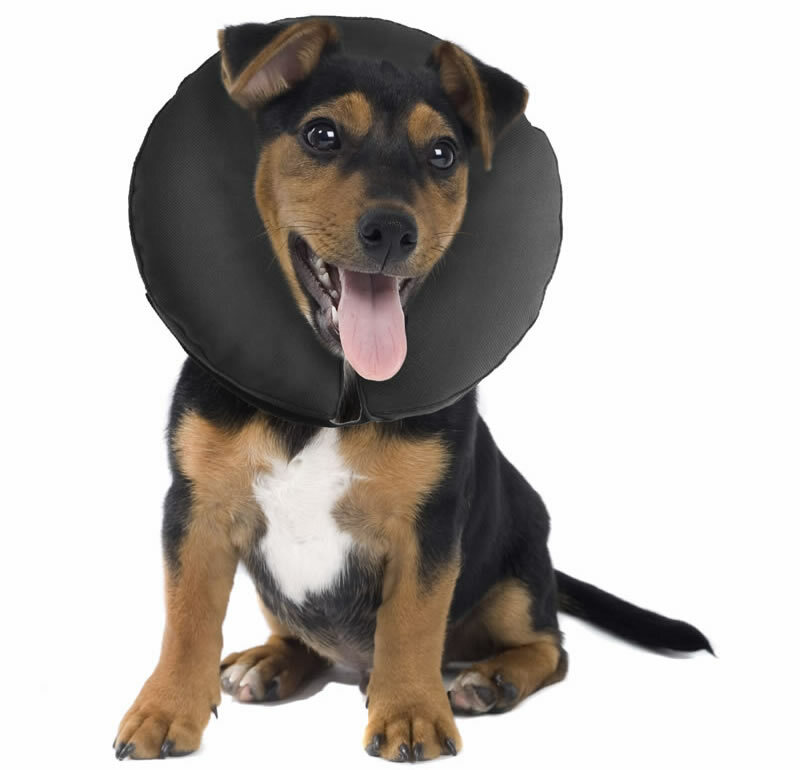 Always monitor a pet post-surgery to ensure that the collar is working properly. 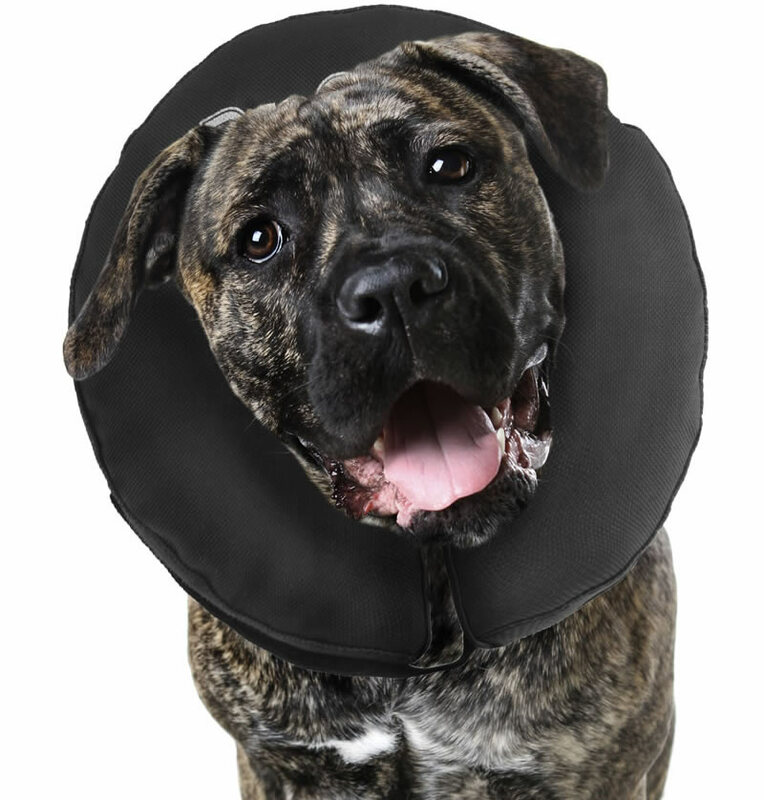 It's important to secure the positioning of the ProCollar in the right place using your dog's regular collar within the fabric hoops of the ProCollar. This collar works really well for injuries on the body. 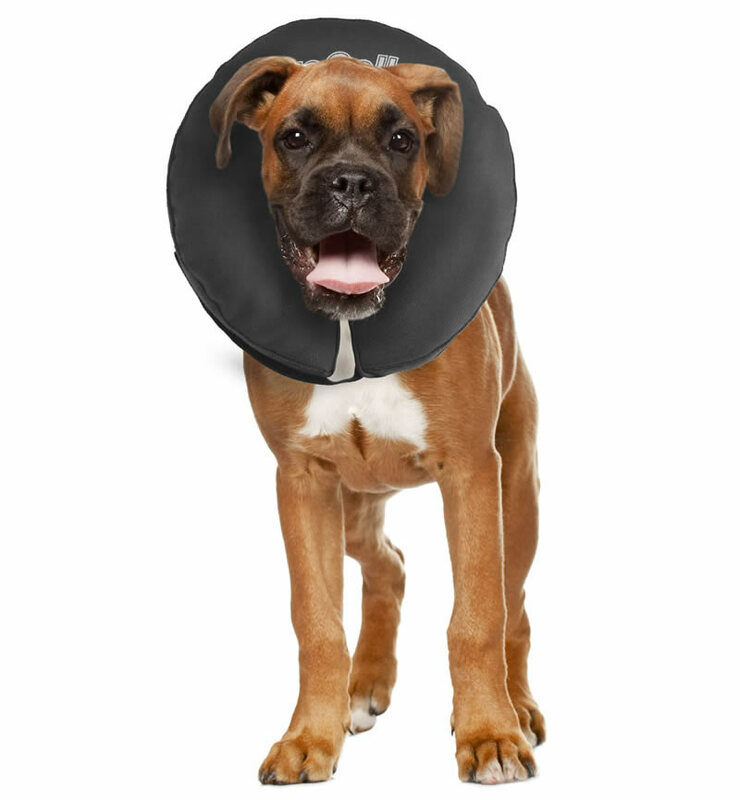 With any type of collar (including the big plastic cones) some determined rascals may still be able to reach their hind quarters, tails and paws. The ProCollar is not recommended for breeds with longer bodies and longer necks such as daschunds, whippets, greyhounds, dalmations or dobermanns. In these circumstances, or if you have an extremely determined dog, you may find it preferable to use the ProCone. 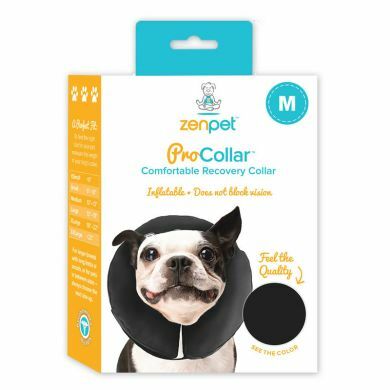 Read 12 customer reviews of ZenPet Inflatable Protective Collar. The average customer rating is 4.8. Very unfortunately, my dog passed away this morning by an accident. I did not have a chance to try his Protective Collar in actual use. Yesterday, I happened to take my dog to his vet. I showed his vet the Protective Collar. His vet commented that it is a useful product. I am holding the Protective Collars at the moment, as I might get another dog in future. I bought the ZenPet Inflatable Protective Collar for our gorgeous Kelpie who broke all four bones in her lower back leg. It worked brilliantly and kept her splint and bandages away from her mouth. I loved it much that a bought a second one after only 15 days from ordering the first one. Unfortunately my son's 13 week old Kelpie cross pup got her teeth into the first one and the collar slowly deflated. This was no reflection on the quality of the collar - the pup just has the most amazing sharp little teeth! 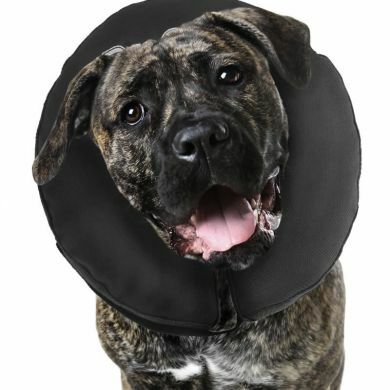 I would highly recommend the inflatable collar to any owner who needs to preserve stitches or bandaging. Used this collar for Miss Eva (dog!) after she was spayed. I was fairly sure that a traditional cone would have stressed out this little girl. We put the collar on a few times before the time it was needed and walked her about with her lead on (her equivalent to work time) so she didn't see the collar as a play thing that needed removing! 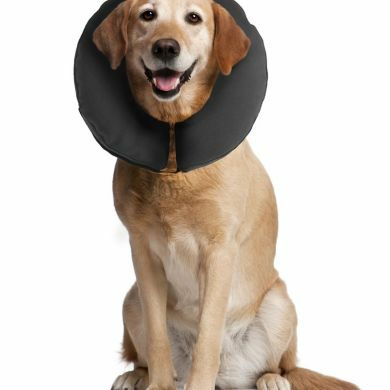 It has been great would recommend this as a great alternative to the cone, great for the dog, your legs and the furniture. 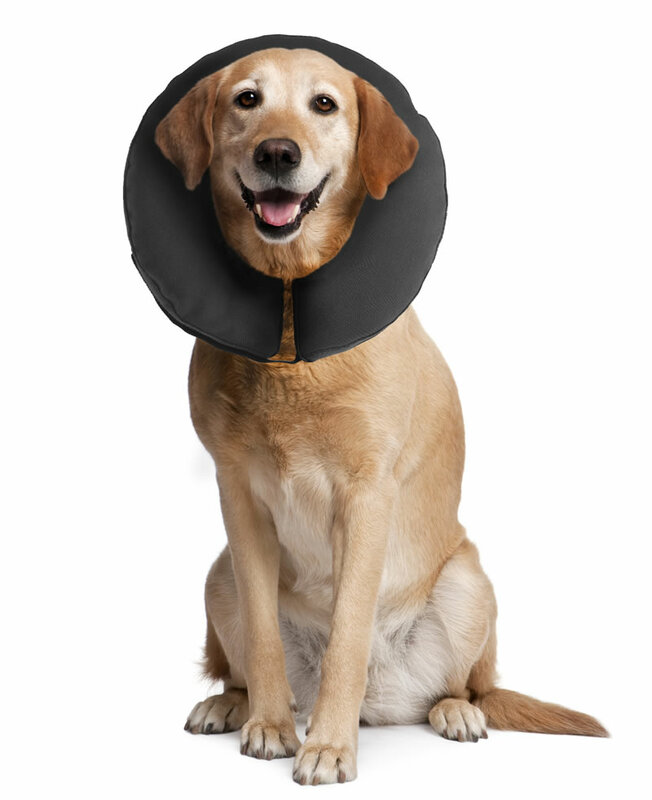 This is a much more comfortable alternative to the dreaded plastic cone. My dog would rest her head on the collar and go to sleep. It works superbly for preventing licking or scratching for all parts of the body except the tail. I would definitely recommend it. The ZenPet Inflatable Protective Collar made the world of difference for my 15 year old, poorly sighted mini foxie x jack russell. He can't see very well and with the normal 'cone of shame' he runs into things and gets frightened by the scraping noise. 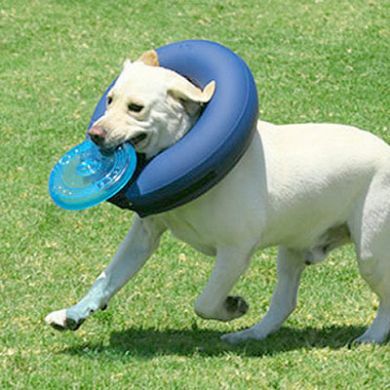 The inflatable collar didn't obscure his vision and if he ran into something he just bounced away. As an added bonus he looked ridiculously cute, almost like he was going sailing, but it was comfortable for him to walk and sleep in and he never once tried to take it off. The Procollar is exactly what was required for our Sheltie. I already had the lamp shade of shame. The vet informed us we would have to stop our Sheltie from licking his ulcerated hind leg. I returned home and put the lamp shade of shame on the boy. He instantly slunk to the floor with no desire or will to get about. We were told he would need to wear the lamp shade of shame for up to 8 weeks. I decided to look for alternatives. That's when I found the Procollar on waggle. At first the boy was wary of the Procollar, but soon he got used to it. He seriously walks around happy as, thinking it's like a crown or something. Better still, he's had it on for three weeks now and the ulcer is healing up fine. He got two thumbs up and five stars from the vet. It's possible the ulcer could heal in half the time of the original estimate. That's 4 weeks less of vet visits and pharmaceuticals. So the price of the collar is paid off in no time. For anyone interested, our Sheltie uses a large Procollar. I was extremely happy with this product for my maltese x. She initially came home from the vet wearing the dreaded cone of shame and refused to eat or drink water. As soon as I swapped it for the ProCollar, her mood immediately changed and she returned to her happy self. I would highly recommend this product, it not only stopped my little girl from scratching at her wound, but it also assisted in making her recovery as smooth as possible. So far so good! Mutley even seems to like it - uses as a pillow. Probably won't prevent dog from getting to every surgery site, etc., but has worked well for keeping Mutley from his stomach and allowed the wound to heal.